(LEFT) A view of Q2 from the rear showing the connection terminal and the left and right HE sensors. You can see the adjustment rails they ride on. (RIGHT) Q2 from the front. The thermometer is on the left and the U-tube vacuum gauge is on the right. As in Q1, I used two Hall Effect devices as sensors to operate the logic relays and one for the pendulum impulsing. The Allegro type UGQ5140K HE sensors proved to be the most practical because of the built in solenoid drivers. 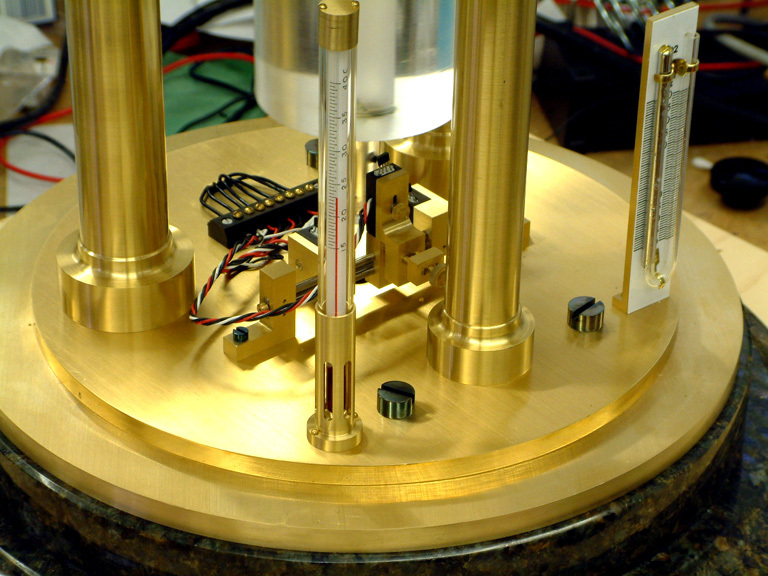 The sensors are mounted below the lower pendulum bob so that there is a sensor on the left side, right side and at the center of the pendulum rod. 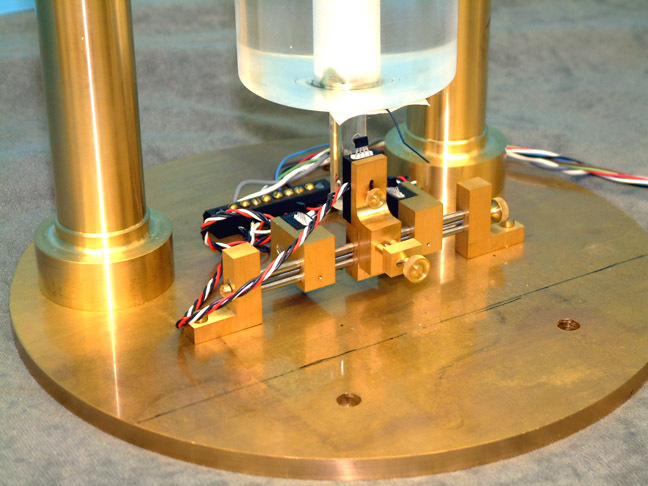 Each sensor has its own associated magnet mounted on the pendulum rod. The sensors are mounted on a rail with associated micrometer adjustments on the x and z axes so that the sensors can be adjusted relative to the pendulum rod magnets. I used cobalt magnets because they have the least flux change with temperature. The left and right side sensors sense which direction the pendulum is going in order to know which “hammer” to drop on the proper pallet. The center magnet is the one that actually sets the hammer in motion. 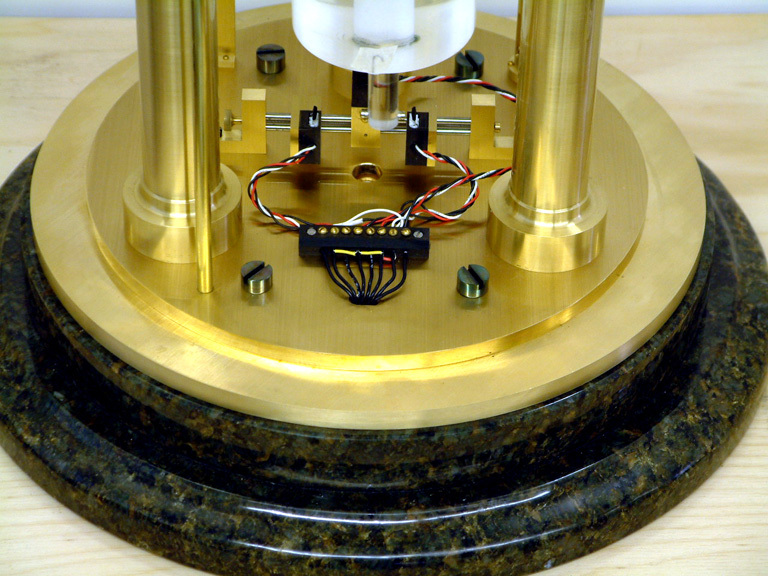 The center sensor rides on a pair of stabilizing rails with a micrometer adjustment to be able to move it left or right to adjust it so that it gives impulse exactly as the pendulum passes center. 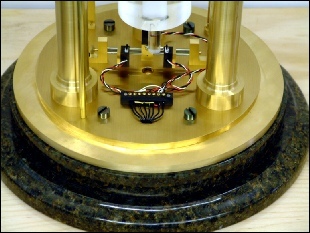 The HE device also has a micrometer adjustment to set it closer or farther away from the pendulum rod to adjust the sensitivity of the HE device. 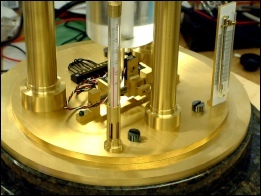 There is also a vertical adjustment to set the HE device in exactly the same plane as the magnet on the pendulum rod. (ABOVE) A closeup of the HE device mechanism. 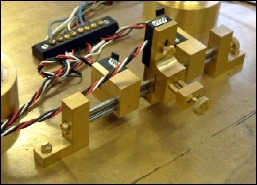 The center sensor rides a a pair of steel rails and can be by means of a micrometer screw arrangement. The same is true with the in and out adjustment of the sensor. A view from the front left showing the sensor arrangement. (RIGHT) The test setup I used while I was experimenting with the sensor placement and design. 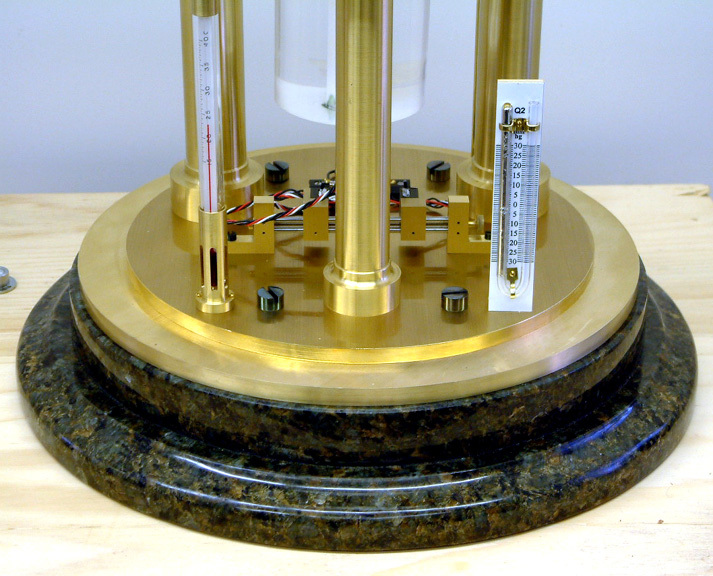 This was before the dial movement was made and before I had the marble base designed.